A translation is transformation which shifts a graph vertically, horizontally, or both. Let f be a function and c a positive real number. The graph of y=f(x)+c is the graph of y=f(x) shifted c units upward. 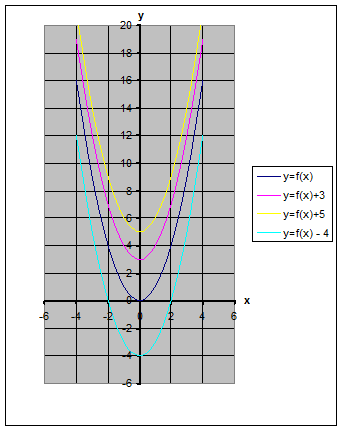 The graph of y=f(x)-c is the graph of y=f(x) shifted c units downward. 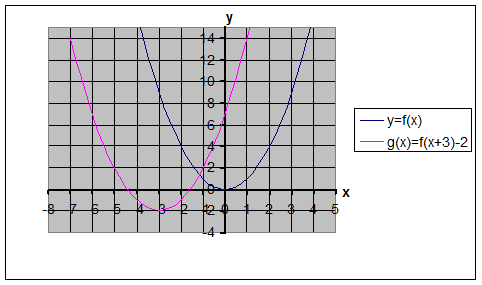 The graphs of y=x2 and its three vertical translations are shown below. 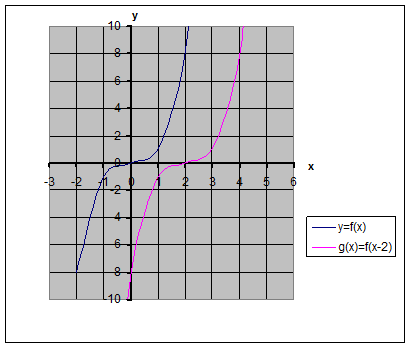 The graph of y=f(x+c) is the graph of y=f(x) shifted to the left c units. 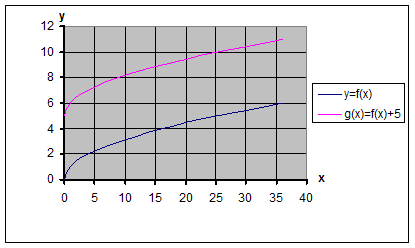 The graph of y=f(x-c) is the graph of y=f(x) shifted to the right c units. Graph y=|x| (blue graph) and then do the horizontal translations. Use the graph of f(x)=√x to obtain the graph of g(x)=√x +5. Use the graph of f(x)=x3 to obtain the graph of g(x)=(x-2)3. Use the graph of f(x) = |x| to obtain the graph of g(x)=|x-2|+4 . Use the graph of f(x)=x2 to obtain the graph of g(x)= (x+3)2 -2. To graph g(x)=√x +5, we first graph f(x)=√x (blue graph) and then do a vertical translation of 5 units upward. The graph of g(x)=√x +5 is the red graph. to the right. The graph of g(x)=(x-2)3 is the red graph. to the right followed by a vertical translation of 4 units upward. The graph of g(x) = |x-2|+4 is the red graph. to the left followed by a vertical translation of 2 units downward. The graph of g(x)= (x+3)2 -2 is the red graph.